Although this is a local history blog, it’s fair to occasionally expand our view to include the stories of our nation’s past. Even when events happened in times or places far removed from our own local experience, they still have had an impact upon who and what we have become as a community. 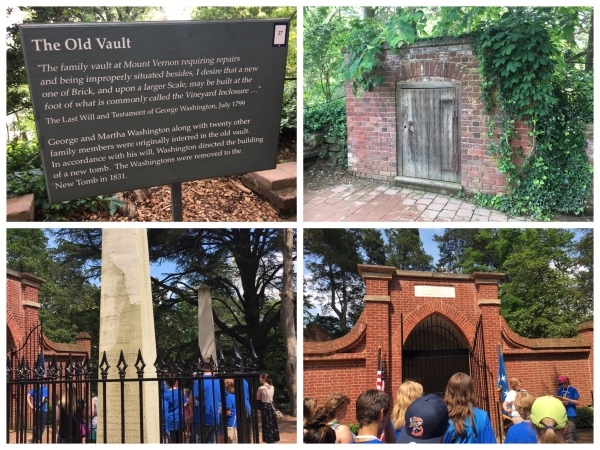 And so in looking at George Washington’s Mount Vernon, a place that was old and crumbling into disrepair before Fort Collins was even established, we connect with the beginnings of our country and discover themes that had an effect on our own city’s beginnings. George Washington’s Mount Vernon – May 2016. In the 1740s, Lawrence Washington, founder of Alexandria, Virginia and a soldier in the British colonial army, settled on some property that his father had owned along the Potomac river (the land having been in the family since 1674). Back in those days, houses weren’t numbered. Instead, the property was given a name as an indentifier. So Lawrence decided to call his house on a hill “Mount Vernon”, in honor of his former commanding officer, Admiral Edward Vernon. Washington and Vernon had fought together in the War of Jenkins’ Ear, a conflict between Spain and Britain which included, at one point, the 8-year old shriveled ear of Robert Jenkins, a British ship’s captain and known smuggler, who had ticked off the Spanish and lost his ear as a result. But in 1752, Lawrence died of tuberculosis, leaving his estate to his wife, Anne Fairfax. Lawrence’s 20-year old half brother, George Washington, managed the property for her. Upon Anne’s death in 1761, George inherited Mount Vernon. It was from this property that George would head off to war as the Commander-in-Chief of the Continental Army in the Revolutionary War. And it was from this property that George and his wife, Martha, would head up to Philadelphia where George would take on his role as the first president of a newly formed union of states. After George Washington’s passing, the property continued to be handed down through the family until, 5 generations later, the soil was depleted from over use and the constant stream of tourists had taken its toll. (Even though it wasn’t being operated as a tourist destination, visitors regularly dropped by to see the home of the first president.) The owner, John Augustine Washington III, decided to sell, but he wanted a promise that the house would not be torn down. He approached Congress in hopes that they might see the value in purchasing such an important landmark for posterity, but they were already embroiled in debates over land and slavery and couldn’t be bothered with the problems of one specific landowner. So, in 1853 when Louisa Dalton Bird Cunngham was traveling down the Potomac river on a steamer and looked upon the western shore, she saw the former president’s house in such utter disrepair that her heart was broken and she sat down to pen a letter to her daughter, Ann Pamela Cunningham, proclaiming that something must be done. She apparently wrote something to the effect that, “if the men of America are allowing the home and burial place of its most respected hero to go to ruin, why can’t the women of America band together to save it?” And thus was born the Mount Vernon Ladies Association, an organization that very deliberately included one Vice Regent from each state of the Union over which George Washington had presided. Because the estate was in the Washington family for almost two centuries, there are several generations of family members buried there. The small brick building shown in the upper right was the original burial chamber. But George, before his death, requested that a new burial vault be built (shown at lower right). Additional monuments were added for following generations (photo at lower left). Although repairs to the mansion ceased during the time of the Civil War (It was hard to hold fundraising campaigns when there were more pressing financial needs on both sides of the war. ), the building remained open for tourists coming to visit. And though Cunningham had to go back to her home in South Carolina to help run the family plantation, two people remained on site to protect and maintain it — one Northerner and one Southerner. In July of 1861, General Winfield Scott declared the estate to be non-partisan, which kept either side from garrisoning soldiers there and risking damage to the buildings. When the war finally ended, the Mount Vernon Ladies Association was able to reconvene and renew their preservation and restoration efforts. 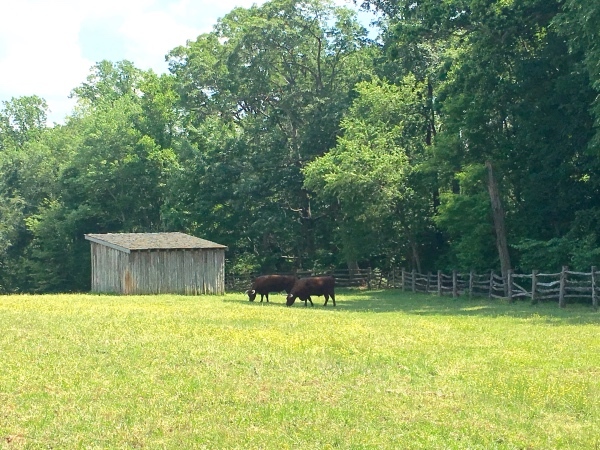 Bulls in the field at the Mount Vernon estate. The women of the Association decided that when people thought of Mount Vernon, they thought specifically of George and Martha Washington. So they determined to restore the property back to what it looked like during that time. They collected any 18th century furniture they could find to make the house look appropriate for the period. Since that time, however, the Association has been able to do one better, searching for original artifacts owned and used by the Washingtons, and installing them in the house. 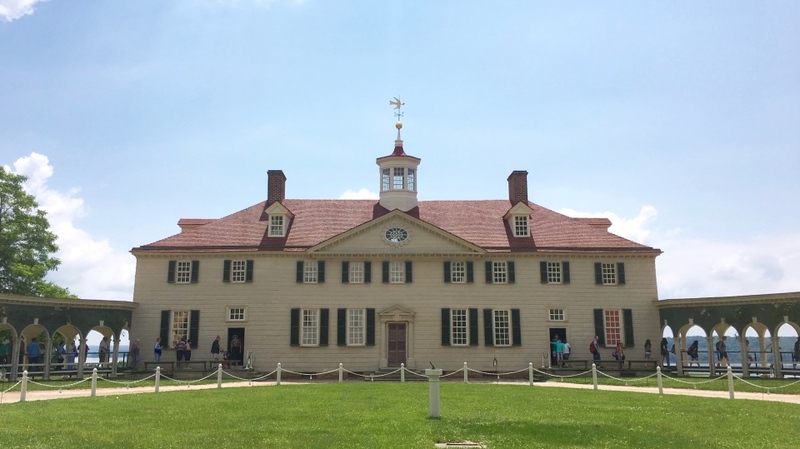 But, as our understanding of history grows and changes over time, and as we begin to see that some stories are bigger and more nuanced than we might at first have thought, the story portrayed at Mount Vernon has also continued to grow and change. As research has been done on the lives of the slaves that Washington owned, commensurate displays have been put together to show what their living quarters probably looked like and where on the estate (and on other estates owned by the Washingtons) they lived. 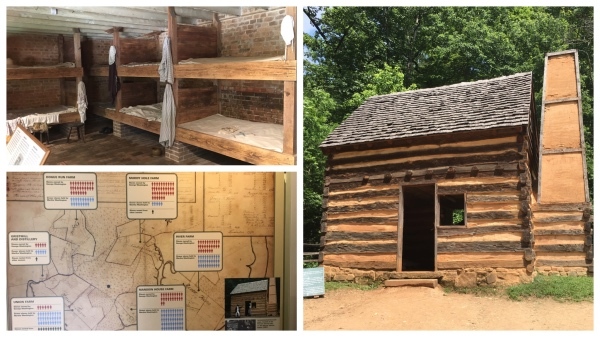 The bunks show at top left are similar to what single or young slaves would have slept in. The cabin, at right, is a recreation of a cabin found on the property and believed to have housed a family of slaves. The chart at bottom left shows the number of men and women slaves living at each of the Washington properties. At least two of his slaves managed to escape to freedom in Philadelphia. Washington was the only president to leave a will which freed his slaves. As the site continues to improve and grow as a place of education and interpretation, more buildings have been added. An old, disintegrating cabin was said to have once been a slave shack. 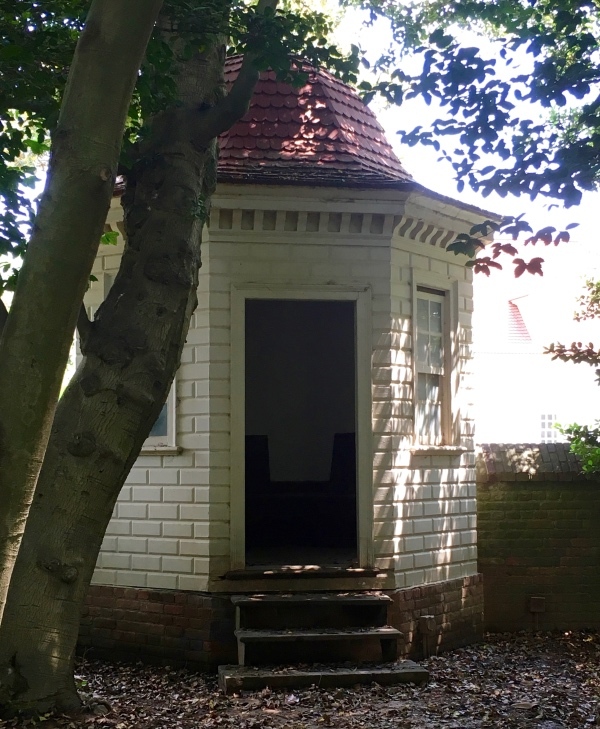 By studying what remained of the structure, a new building was created in its likeness to give a sense of what a slave house might have looked like. 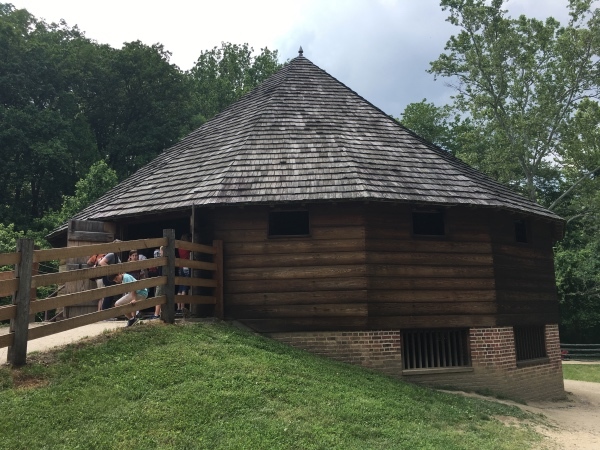 Washington also invented a process whereby his horses would tread on the grain as they walked in a circle around the inside of an octagonally shaped barn. The grain seed would fall between the slats of wood that made up the floor to be stored in the basement below while the straw would remain above the floor, making it easy to rake into another storage area. Though the barn had been located on another of Washington’s estates, a reproduction was built at Mount Vernon for visitors to see. This is a reproduction of a barn that George Washington designed. The mansion at Mount Vernon looks truly grand along the Potomac river. Ostensibly made of stone with a symmetrical facade and two expanding wings, it makes an impressive picture. But upon closer inspection, one finds that the building is actually made of wood. 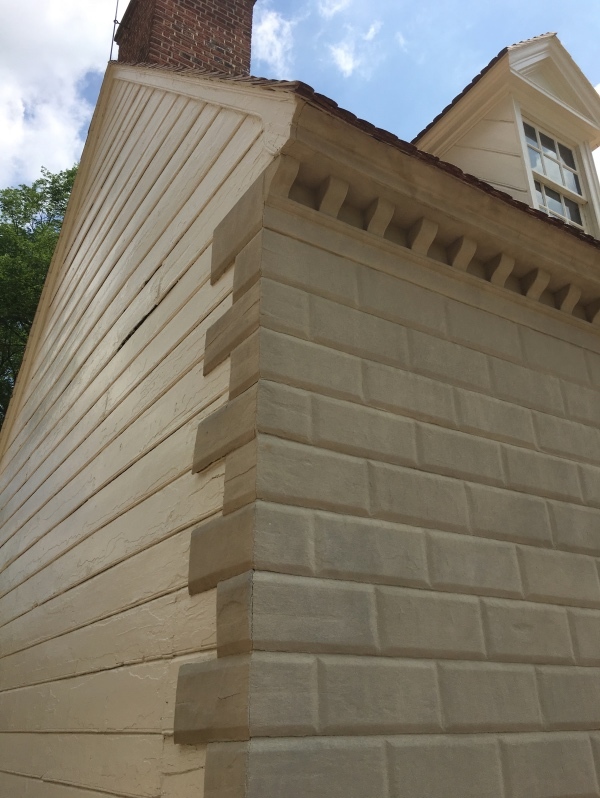 The Washingtons used a process called “rustication” to make wood look like stone. Pine boards were grooved and beveled to create the appearance of masonry. After being varnished and painted, a fine sand was thrown on the wet paint to complete the effect. The rusticated wood at right, that looks like stone, is what the casual observer would notice. But around the sides of the building that are less visible, the wood cladding can be seen. 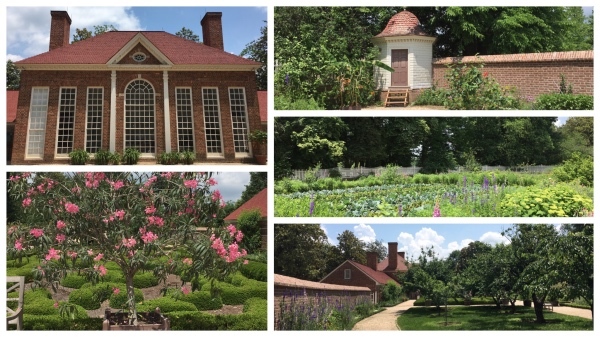 The grounds have changed over the past two centuries, so research has been done to determine what George Washington’s gardens might have looked like. A greenhouse that included slave quarters and storage in back was rebuilt using archeological evidence as well as what could be found in old paintings of the property or old descriptions. The building at upper left is the greenhouse. The building at upper right is where seeds were stored, and the rest of the photos shows various parts of the restored gardens at Mount Vernon. Mount Vernon is important because of its association with our nation’s first president. Though most of the important events that took place during the Revolutionary War and first presidency didn’t happen here, the connection between George Washington and his home has long held great importance to Americans. The mansion can be found depicted in countless paintings and early postcards, engraved on spoons, porcelain pitchers and plates, and affixed to a variety of other items. (Just check eBay to get a sense of the range.) And many cities have a street, park or square named after this famous estate. Since earliest days this property has held a special place in the national consciousness. In Fort Collins we have a Mount Vernon Court, located just off of Ticonderoga Drive near Warren Lake. That appears to be are only connection to the property. It’s likely that Mount-Vernon-mania had worn off a bit by the time we were beginning to name things in our town. But we do have a Washington Avenue on the west side of Old Town. And we once had a Washington School on S. Shields (later called the Lab School and now a preschool run by CSU). If you’re planning on visiting Mount Vernon, I’d recommend that you purchase tickets in advance online. That will save you $3 per person. If you’re staying in Washington DC and don’t have a car, it’s very easy to take public transportation to the site. The source I relied upon the most for this piece was a visit we made as a family to George Washington’s Mount Vernon on May 31, 2016. All of the photos shown here were taken during that trip. George Washington’s Mount Vernon: The Dramatic Rescue of George Washington’s Estate (pdf). Mount Vernon: The Civil War Years, from the Mount Vernon website. Wikipedia’s entry on Lawrence Washington, George Washington, and Mount Vernon.